Five days later, I found myself in surgery, again. This would be another day that would change my life forever. Today I was going to lose my breast. My mind was whirling again. Why me? I remember waking up in the recovery room, my left chest covered in a shroud of gauze and tape, so padded that it almost looked as though my breast was still there. I was in and out, lost in a sleepy haze and nausea. My back hurt, my shoulder hurt, and I was a one-breasted woman. The next day, I was sent home to recover. How does one recover from losing a breast? I have lost a breast, and I am in mourning, but I am alive. Today was my first day as a cancer survivor! As soon as I felt strong, I wanted to go to the library and check out every book on breast cancer. I want to know what I need to do to win this battle. I wanted to be prepared when I went to see the oncologist, another new word in my vocabulary. Probably the “nurse” in me, but I wanted to know what they were saying, I wanted to understand my options. I made my first appointment. Oncologist No. 1 … was highly recommended, rather insensitive, but highly recommended. But what would they know, they didn’t lose a breast! This oncologist studied the reports, and then told me I was one of the lucky ones. I had a very small tumor — 7 millimeters — my lymph nodes were all negative, and I would not benefit from chemo. The risk outweighed the benefits. Was I lucky? I thought so, until I was called back a week later and told that because my tumor was HER2 positive. They really did not know what to do with me. It was up to me if I wanted chemo. Up to me? I thought the oncologist was the expert! Oncologist No. 2 was local, actually quite close to my home and well respected in a small town. This oncologist looked at me, looked at all my reports and then proceeded to tell me “ I fell into a gray area.” They didn’t know what to do, or if I would benefit from chemo. This is getting old; I thought these were the experts! Oncologist No. 3: This oncologist treated my mother, and my mother had survived many years. She is a professor of oncology at Rush University Medical Center in Chicago. I valued her opinion; after all, she treated my mother! She read all the reports, pondered and then had a plan. I felt at ease, I felt at peace. I felt trust. I knew I was in the right place. I felt at home! That was in 2002, nine years ago. Seems like forever. I did recur in 2003, and have been in treatment ever since. I calculated it one time; I believe I have made 500+ trips to Rush in Chicago, a 150-mile trip each time I go. Many people ask me why I travel all the way to Chicago, when there is a brand new cancer treatment center within walking distance of my home. It’s called trust. 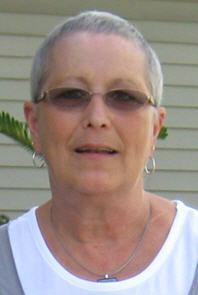 I credit each year I have been a survivor with the oncology team at Rush! It is so worth the drive, I wouldn’t go anywhere else. I feel that I am an important individual who is cared for and welcomed from the employees at the front desk, the lab, triage nurses, the pharmacy team, the nurses and doctors. There is a sense of confidence and knowledge exhibited by all. The quality of care is above and beyond. I have been truly blessed with the best in the Midwest. What started as a small and simple oncology floor is now a beautiful oasis for cancer patients. My first oncologist, Dr. Janet Wolter, has retired. She was more than my oncologist, she became an amazing part of my life, and she became my friend. I am fortunate to now be under the care of Dr. Melody Cobleigh, who took on many of Dr. Wolter’s patients. I was the first patient to arrive the opening day of Rush’s new outpatient cancer center, and was in awe of the new surroundings. It was truly designed with the patients in mind, from the bright colors to the artwork on the walls. I feel fortunate to have the opportunity to receive my cancer treatment at Rush. After nine years, it just keeps getting better, and each time I go, I feel there is no place like Rush. It truly feels like home. This entry was posted in Cancer, Patient Stories, Rush University Cancer Center and tagged breast cancer. Bookmark the permalink. What a great article. How smart you were to search out the very best. Keep fighting the good fight and know that your friends look at you with awe. You are truly an inspiration to so many. With much love and such great memories of lots of laughs. It was so interesting to read about your experience. I wish I had a a Rush Center where to go and feel as confortable as you do. God bless you and God bless all our breast cancer sisters.